African American artist Robert Seldon Duncanson (1821–1872) was widely recognized during his lifetime for pastoral landscapes of American, Canadian, and European scenery. Recent scholarship, however, has begun to focus on a small group of still-life paintings (fewer than a dozen are known) that Duncanson produced during the late 1840s. Spare, elegant, and meticulously painted, these works reflect the tradition of American still-life painting initiated by Charles Willson Peale and his gifted children—particularly Raphaelle and Rembrandt Peale. Still-life paintings by Duncanson are extremely rare and highly coveted. Signed and dated 1848, Still Life with Fruit and Nuts is a particularly fine example and the first work by Duncanson to enter the Gallery's collection. Classically composed with fruit arranged in a tabletop pyramid, the painting includes remarkable passages juxtaposing the smooth surfaces of beautifully rendered apples with the textured shells of scattered nuts. Self-taught and living in Cincinnati when he created his still-life paintings, Duncanson exhibited several of these works at the annual Michigan State Fair. During one such exhibition, a critic for the Detroit Free Press wrote, "the paintings of fruit, etc. by Duncanson are beautiful, and as they deserve, have elicited universal admiration." The artist's turn from still-life subjects to landscapes conveying religious and moral messages may have been inspired by the exhibition in Cincinnati of Thomas Cole's celebrated series The Voyage of Life. Cole's allegorical paintings were purchased by a private collector in Cincinnati and remained in that city until acquired by the National Gallery of Art in 1971. Exposure to Cole's paintings marked a turning point in Duncanson's career. Soon he began creating landscapes that incorporated signature elements from Cole and often carried moral messages. Following the outbreak of the Civil War, Duncanson traveled to Canada, where he remained until departing for Europe in 1865. Often described as the first African American artist to achieve an international reputation, Duncanson enjoyed considerable success exhibiting his landscapes abroad. His achievement as a still-life painter has only recently become apparent. 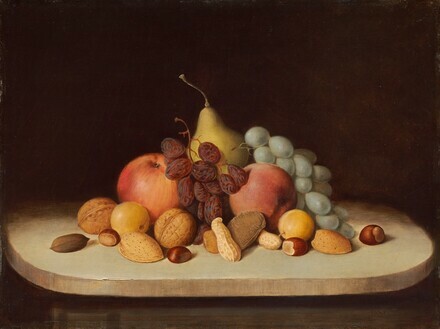 The exceptional quality of Still Life with Fruit and Nuts suggests that much remains to be learned about this little-known aspect of his career. Thanks to the generosity of Ann and Mark Kington/The Kington Foundation and the Avalon Fund, Duncanson's masterful still-life painting hangs in the American galleries not far from Cole's Voyage of Life. (sale, Phillips de Pury & Luxembourg, 23 May 2000, no. 22); (Babcock Galleries, New York); private collection; purchased 29 December 2011 through (Babcock Galleries, New York) by NGA. Vogel, Carol. "Inside Art: Still Life at the National." New York Times 161, no. 55,670 (February 3, 2012): C29, color repro. Klein, Shana. "Cultivating Fruit and Equality: The Still-Life Paintings of Robert Duncanson." American Art 29, no. 2 (Summer 2015): 66-68, color fig. 3.